Russian physician; born in Bobruisk 1848. He studied in the rabbinical school of Jitomir and in the Imperial Medico-Surgical Academy of St. Petersburg, and graduated from the latter in 1877. He took part in the war against Turkey and was twice decorated by the czar. After serving some time in the clinical hospital attached to the Voyennaya Akademia, he was appointed physician in ordinary to the Aleksandrovski Hospital of St. Petersburg. He wrote: "Svyedyeniye o Gemofilyi v Talmudye" (St. Petersburg, 1884); "ReMaH Ebarim," on anatomy (ib. 1888); "Anatomiya v Dreynoyevreiskoi Pismennosti" (his dissertation on taking his doctor's degree; ib. 1889); "Die Rituellen Reinheitsgesetze in der Bibel und im Talmud," in "Monatsschrift," xliii. and xliv. ; "Vavilonskoye Plyeneniyl," on the Babylonian dispersion, in "Voskhod," 1900; "Religiya i Politika v Istorii Drevnikh Yevreyev," in "Sbornik Budushchnosti," vol. i. He wrote also, in Hebrew, "Shirat ha-Zamir," a novel, Warsaw, 1895. 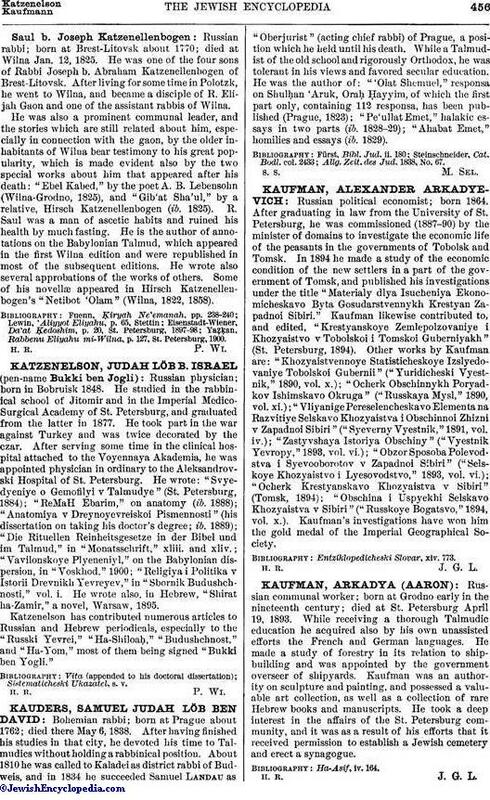 Katzenelson has contributed numerous articles to Russian and Hebrew periodicals, especially to the "Russki Yevrei," "Ha-Shiloaḥ," "Budushchnost," and "Ha-Yom," most of them being signed "Bukkiben Yogli."